Participants of the 1-mile walk, held by Beacon Academy, gather before the start of the event. The walk was held to help raise money to build a water well in Haiti. Students and faculty at Beacon Academy, an independent high school in Evanston, walked 1 mile Wednesday to raise money for a water well project in Haiti. 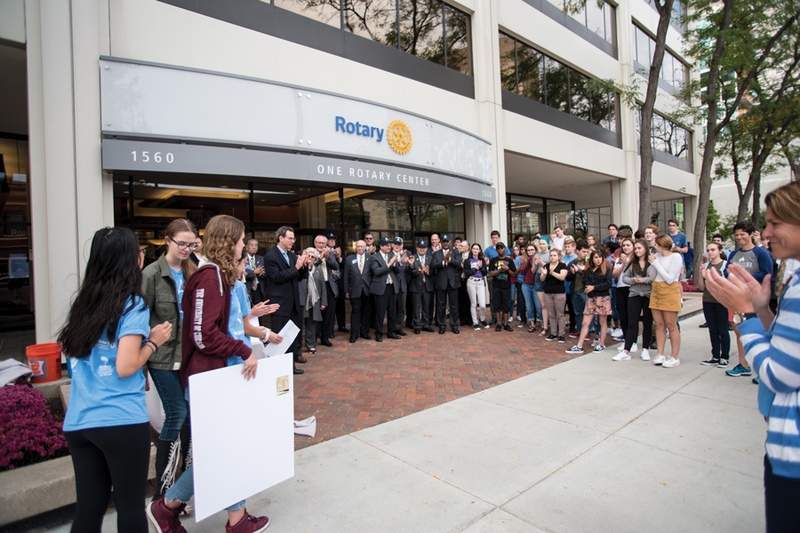 The east Evanston walk was the first of three initiated by the high school’s Interact club, a Rotary-affiliated group that works with students on humanitarian projects around the world. Participants began at Beacon Academy and then set off toward Lake Michigan, simulating the 1-mile walk some impoverished Haitian communities must undertake daily for fresh water. Students also carried buckets to help understand the physical strain not having clean water puts on Haitian communities. Though the school only started with 37 students when it opened four years ago, the student body has grown to 137, said Katie Petzer, the head faculty organizer of the event and an advocate for hands-on student programs. “The thought of starting a school, growing it as quickly as we have and taking on a project of this size — it’s pretty remarkable,” she said. Many students involved in the walk are champions for clean water and they hope to not only provide clean water for Haiti, but also raise awareness for the global water crisis, Petzer said. Petzer said she was “overwhelmed” by the unprecedented fundraising success. As of now, the school has raised $12,000 through various fundraisers. Petzer said the goal is to raise $15,000, which is enough to complete a new water well in Haiti. Beyond the local walks, Petzer said she will lead eight Beacon students to Haiti for the grand opening of the well. During the trip, the group also plans to meet students who attend the local school, she said.